The flavour of Apple Cider Vinegar is unique and not for everyone. That’s why we’ve used our Apple Cider Vinegar expertise to create our new range of easy-to-swallow, convenient capsules. Our natural fermentation and gentle drying process ensures ‘the Mother’ is retained, so you get all the benefits of apple cider vinegar in an easy-to-swallow capsule minus the vinegar taste or smell. Our High Strength Apple Cider Vinegar capsules contain naturally high levels of acetic acid, at over 40mg per capsule. We use a gentle drying process to ensure ‘The Mother’ is retained, so you get all the benefits, without the vinegar taste or smell. ‘The Mother’ enzyme is a living mixture of beneficial bacteria and minerals only found in authentic, natural, high quality vinegars. Take 3 capsules per day. 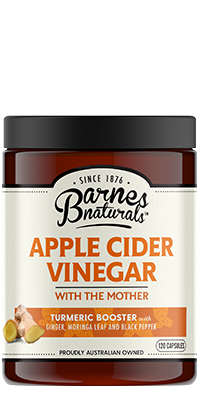 Apple Cider Vinegar powder (75%), Microcrystalline cellulose, Silica, Magnesium stearate, Vegetarian capsules. Store in a sealed container in a cool, dry area away from sunlight. Do not use if tamper evident seal is broken or missing. Our Apple Cider Vinegar Echinacea Soother capsules are a carefully crafted combination of apple cider vinegar with specially selected health and wellness herbs - Echinacea, Garlic and Clove. We use a gentle drying process to ensure ‘The Mother’ is retained, so you get all the benefits, without the vinegar taste or smell. ‘The Mother’ enzyme is a living mixture of beneficial bacteria and minerals only found in authentic, natural, high quality vinegars. Apple Cider Vinegar powder 300mg (36%), Garlic powder 225mg (27.5%), Clove powder 112.5mg (13.7%), Echinacea juice powder 33.33mg* (4%), Microcrystalline cellulose, Silica, Magnesium stearate, Vegetarian capsules. Our Apple Cider Vinegar Turmeric Booster capsules are a unique combination of apple cider vinegar crafted with specially selected superfood antioxidant ingredients - Turmeric, Ginger and Moringa Leaf - traditionally used to support health and wellbeing. We use a gentle drying process to ensure ‘The Mother’ is retained, so you get all the benefits, without the vinegar taste or smell. ‘The Mother’ enzyme is a living mixture of beneficial bacteria and minerals only found in authentic, natural, high quality vinegars. 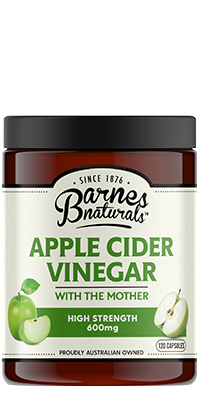 Apple Cider Vinegar powder 300mg (37%), Turmeric root powder 200mg (25%), Moringa oliefera leaf powder 100mg (12.5%), Ginger root powder 50mg (6.2%), Black Pepper extract 5mg (0.6%), Microcrystalline cellulose, Silica, Magnesium stearate, Vegetarian capsule.